AFTER READING ALL the Jaiku comments and watching some intense video minutes (HD recorded at left), I really wish I could have attended Podcamp Ireland. Being an organiser meant spending more time between sessions, waiting outside for visitors and ensuring the lights stayed on or the muzak stayed off. Some very remarkable items will emerge on the heels of several hours of recorded audio and video. I believe some of the content emerging from Podcamp Ireland will result in centres of excellence borrowing the content for use in short courses designed to give a voice to creatives, politicians, and people interested in communicating effectively online. Along with several other organisers, I have circled a red box around Saturday, 27 September 2008 because that should be the day of Podcamp Ireland 2008. I hope Podcamp 08 will follow a day-long session on creativity and that some attendees of the Friday event will stay for the Saturday Podcamp. But even if the companion event fails to sync with next year's podcamp, I know the number attending next year will crease the century mark. In the meantime, I've written some random thoughts in the hope that an after-action conference call can focus our energies and make 2008 a killer event. WELL BEFORE THE OPENING coffee at Podcamp Ireland, the event's back channel buzzed with planning and programming cross-talk (see left). Some of it bubbled over onto the screens of others who had no intention of attending the event but who shared something in common with the setting, the people or the idea of podcamp. We expect 77 people today in Kilkenny, all interested in social media from the point of view of listening, reading, contributing or producing personal media. 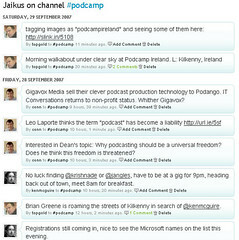 During the day, I will be watching the Podcamp Ireland back channel, hoping that at least 10 newcomers adopt to the concept and finish the day listening to the continuing conversations through Jaiku. To set up your phone to receive text messages from Jaiku's podcamp channel, you need to register for a free Jaiku account, trust Jaiku with your mobile phone number and then respond to a text message containing an authentication code. Once you've done those things, you can send 140-character messages directly to Jaiku by texting +467374940501. I've used Jaiku since May 2007 and trust its system to keep me informed by sending me text messages in several channels related to creative multimedia and industry events. The back channel for today is http://jaiku.com/channel/podcamp and it is available as a newsfeed. Images will be tagged as "podcampireland" when uploaded to social networks. THE ARCADE FIRE and Eurovision? Who would have thought? At some concerts, the Arcade Fire cover a song that Serge Gainsbourg wrote for popular French yé-yé singer France Gall, which she performed at a Eurovision concert way back in 1965. We're setting up Podcamp Ireland's venues and loving it in our earbuds. A QUICK J-TEXT from Nadya piqued my interest. After "a super depressing dinner" in Amsterdam, she wrote, "So I'm sitting between one of the people that worked on inventing the compact disc, the sales director of Google NL, the CFO of UPC the cable company, and no one can really TALK to each other, nor are they at all in touch with what I would call the creative industry. I asked them if they had seen any of the talks, and they say no, and that they think there is no new generation of thinkers or visionaries." I sometimes get the same feelings at paid conferences--until I hover around coffee chats and introduce myself in casual settings. Nonetheless, I have felt the same attitude noted by Nadya when attending events where the principal speakers or the marquee attendees had no interest in those attending the event. The problem with most typically commercial conferences is the assumption taken by main speakers that the only valuable flow of information starts at the microphone and trickles into the audience. Another typical reaction by some speakers is that they really don't have the time to read more blogs or to engage in lively social networks. Not so at Podcamp Ireland. If you fancy learning how some of the most creative people in Ireland connect to enhance their practise, you should set aside Saturday the 29th of September to see some of the faces worth reading regularly. But if you're unable to journey to Kilkenny, you can catch the enthusiasm in the photostream, in the podcamp Jaiku channel, and in the podcasts that will follow. And you should also think about reading one of the "79" creative essays. AS SOMEONE WHO RINGS up hundreds of euro each month in mobile data charges (see the extortionate effect of data roaming here), I have scratched out five ways to spot someone who does not know more than their default screen on a mobile data device. Although people always want desktop speeds to fit into their pockets, only a mobile web newbie would expect the same browser behaviour, the same formatting of content and the same rich media services. We differentiate these factors in several creative multimedia modules in Tipperary Institute. Moreover, we set up our stall on the premise that the greatest potential for mobile web applications will be achieved by discarding the assumption that everything on a mobile needs to originate and complement what we do on our desktops or laptops. Not so. Effective mobile applications are often simpler, more intuitive and less decorative than what people have defined as the internet. In my mind, the mobile imperative for a business user occurs when you get time-sensitive email headers when underway, when your newsfeeds bubble up before the broadcast bulletins and when you can get expert answers delivered by text when you cannot ring for help. ALTHOUGH THE TECH audience visiting here like me to stay on message, recent events prove visitors like the social dimension of my technology-laden life. Nothing is more social than a birth announcement. We welcomed Mia Rose Goldbach into the warm delivery ward of St Luke's Hospital in Kilkenny, Ireland at 2255 Sunday the 23rd of September. She arrived at 8 lbs, 1 oz and is a long and active little girl with ginger curls. Mom performed in labour better than the Irish front line in scrum. Ruth and I are overwhelmed at the flood of best wishes coming directly into our pockets. Unfortunately, many of those who work alongside Ruth and me cannot see the main flow of images surrounding the little girl's birth because censorware blocks Flickr during the workday. So instead of flicking through a photostream while multi-tasking, many of our friends pick up the company phone and dial us for an update. The end result: the company pays another cost for blocking content and we have another example of the folly of blocking knowledge workers. Mia's entrance means I won't be posting as much here as before. I don't think I would want it any other way. Shel Holtz -- "Announcing the Stop Blocking Campaign"
Mia Goldbach in an unblocked photo album. ALTHOUGH MOST TECH news sweeps right by me at the moment (see Flickr photostream for the main distraction), my FreeNews client told my P910i that something significant was brewing around Facebook, the online social network where all of my students (and every Microsoftie I know) are establishing an academically-accessible toehold. Microsoft's overtures may result in an investment of $300m in Facebook but more importantly, if Microsoft succeeds in beating both Yahoo! and Google to a meaningful investment, it means Google will probably press ahead on its Facebook-killing strategy. Kevin Delaney -- "Microsoft Fires Volley at Google in Ad Battle"
Charlene Li -- "Facebook: Is it worth $10bn?" TODAY IS JAIKU FRIDAY as suggested by Pixenate frontman Walter Higgins and echoed by Alexia Golez. It will be interesting to use Google as a benchmark to measure the uptake of the event. When I posted this item, 38 references appeared to Jaiku Friday on Google. I use Jaiku as a microblogging platform (above) and I trust Jaiku to push 140 characters at a time directly to my phone from 30 people I follow. I follow four times as many people or web sites with Jaiku and I can quickly see changes made by all those people and I can observe changes made on a wide swath of web sites by looking at my home page on Jaiku. We are also using Jaiku in community groups, between college campuses and among political activists for some functions that elevate it from being a mere social networking site. ONE OF THE MOST interesting things about Jaiku Friday is how it connects people, their ideas, and real-time collaboration through text or concise on-screen comments. When you map Jaiku to other social networks (think Flickr, Digg, del.icio.us, mash, or music), you get nodes you would never have imagined. It's something Euan Semple and I chatted about after Reboot 9 and it's something several researchers are now pushing out of their labs. It will become a mainstream conversation in early November, when the newest iGoogle gadget leaves alpha. I told Mitch Joel about my reading of these items in a Greenfields Report filed with Six Pixels of Separation. I record short comments for Mitch's podcast because I learn what I meant to say when Mitch offers his follow-on commentary. I'm very interested in his take on mapping social networks because one result of Google barging into the game will be a frontal assault on the social networking available only inside Facebook. Dan Farber reports on Reactor, "the back end for managing RSS and Atom feeds", and speculates that it could be "used to power activity streams for a project code-named Makamaka to see what feeds your friends are reading or YouTube videos they are watching." 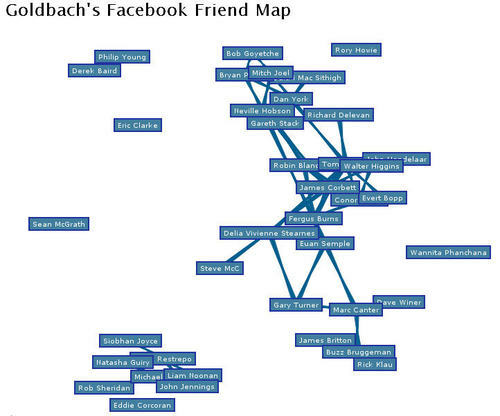 "Interactive Friend Thing" (source of the info in the graphic above) uses the TouchGraph GraphLayout applet which clusters people together automatically. Yahoo! helps me do that with Mash, keeping opt-in central to every step. Greenfields Report #11 on mapping social networks [3.8 MB 96 kbps MP3 file]. There are 22,500 results for iGoogle in social networking before the launch of new iGoogle gadgets in November 2007. Dan Farber -- "Google forays into the heart of social networking"
UPDATED April 2012 with Guardian story from Zemanta. SINCE I STARTED writing for the Irish Examiner, it's obvious the old production line model for news has evolved to a networked mode of operation. I don't have to go to Cork to file my story--it's all done over the internet. That's the same conclusion Paul Bradshaw makes in A Model for the 21st Century Newsroom. Anyone can assume editorial and distribution role. Journalists are no longer limited in the medium they could choose or the time and space to tell a story. What isn't obvious to a lot of traditional journalists is how new developments have changed the way people and organisations find and distribute news. I'm more likely to discover a headline item via the Irish Open Mailing List or on Jaiku than through a broadcast radio report. This isn't an effect limited to a small cluster of people adept with technology. An entirely new manner of distributing breaking news is starting to emerge. In the States, friends share snippets of information on their Facebooks. Like Jaiku, a US-centric service called Twitter offers a simple text-friendly channel for people to share information about what they had for breakfast. 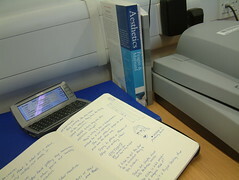 If my American friends had smart phones, they could use Twitter and Jaiku while away from their desks. As hard as editors may try, there's no way young people are going to mirror their grandparents and buy the news in print or sit to hear the news read at set times on the television. News is moving to an online environment and that will shake up the entire field of journalism. I'm waiting for the battle lines to be drawn up by media organisations as new websites emerge in the hopes of attracting people to thematic areas emphasizing sport, fashion, technology, or politics. The emphasis in these new thematic areas must be on speed of reporting and not on the depth of coverage. I'm already seeing the first shifts of the sand as old head fact checkers take their retirement without being replaced on the news desk. Related links curated by Bernie Goldbach on aggregation. 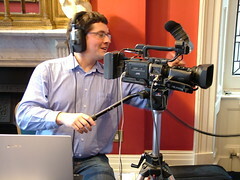 Paul Bradshaw -- "A Model for the 21st Century Newsroom, Online Journalism Blog, September 17, 2007. John Plunkett -- "Don't break stories on Twitter, BBC journalists told", February 8, 2012.